Join the Iditarod Sled Dog Race Alaska in 2020 ! 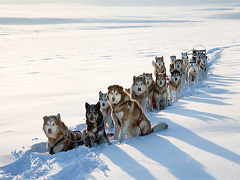 Our adventurous Iditarod Sled Dog Race vacation packages include the Iditarod Ceremonial Race Start on Anchorage's 4th Avenue, the guided tour to the Race restart in Willow. Most of the tours feature the visit to the sled dog kennel of a famous Iditarod veteran including Iditarod presentation, kennel tour and an exhilarating sled dog ride. Highlights are the flightseeing days tours to Rainy Pass checkpoint within the magnificent Alaska Range and to the native village Nikolai. 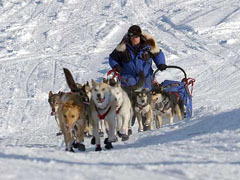 Choose your prefered tour which suites the true Iditarod Fan and active traveler. Experience the Iditarod Race Start on Anchorage's 4th Avenue and the Restart in Willow. This tour includes the visit to a sled dog kennel and an exhilarating sled dog ride, Iditarod Presentation and the Musher's Banquet Tickets. 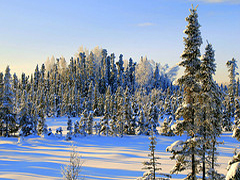 Customize your preferred Iditarod program around the flexible tour package with many options: Join a city sightseeing tour of Anchorage, Prince William Sound glacier cruise, ski for a day at the Alyeska Resort - Alaska's largest ski area, or choose from various fly-out options to remote Iditarod race checkpoints around famous Rainy Pass, Finger Lakes or Nikolai with overnights in wilderness lodges within the Alaska Range foothills. Alternatively take a trip to Nome on the shores of the Bering Sea to observe the action when the first Iditarod Musher arrives after an exhilarating trip of 1100 Miles. Join us and experience the Iditarod Sled Dog Race up close ! 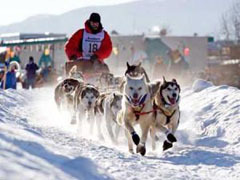 This adventurous and yet affordable Iditarod "Chase the Race" package includes the Iditarod ceremonial race start on Anchorage's 4th Avenue and the Iditarod race restart in Willow. Join the visit to the sled dog kennel of a famous Iditarod veteran including Iditarod presentation, kennel tour and an exhilarating sled dog ride. Another highlight of the tour is the fly-out to Rainy Pass checkpoint within the magnificent Alaska Range. Spend the day observing the sled dog teams and race action. You may extend your Iditarod Race experience and choose an additional fly-out trip to Nikolai checkpoint, a traditional Athabaskan Indian village. This seven day Iditarod tour package covers the highly active Iditarod ceremonial start in downtown Anchorage, the restart activities in Willow and two extremely scenic checkpoint flights to Nikolai and Rainy Pass - within the magnificent Alaska Mountain Range. Our tour services include: overnights in centrally located superior or first-class hotels, Musher's Banquet Ticket, Anchorage city sightseeing tour and of course the two exciting checkpoint fly-outs to Rainy Pass and Nikolai. This is the perfect itinerary for our independent and active travelers who strive to experience some highlights of the Last Great Race on Earth for the first time. Join us and get an unforgettable insight view and first hand race information from the toughest sled dog race. This tour combines the Highlights of the Iditarod Race, a scenic trip with the Alaska Railroad to Fairbanks and Northern Lights viewing. Witness the highly active Iditarod ceremonial race start in downtown Anchorage, the restart activities in Willow and the extremely scenic checkpoint flight to Rainy Pass within the magnificent Alaska Mountain Range. Travel on board the famous Alaska Railroad via the snow covered Alaska Mountain Range to Fairbanks. 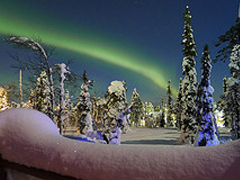 Chena Hot Springs Resort provides some of Alaska's most perfect and almost 100 % guaranteed Northern Lights viewing in a remote wilderness setting just below the Arctic Circle. Enjoy the Iditarod Race Start on Anchorage's 4th Avenue and the bustling preparation of the teams in the morning, a trip to the re-start ceremony in Willow, a visit of an Iditarod veteran, ski plane fly-outs to Rainy Pass and Nikolai checkpoint within the Alaska Mountain Range as well as to the most interesting native village checkpoints along the shores of the frozen Bering Sea. You'll overnight at a wilderness lodges with excellent Aurora Viewing, in first class city hotels and small inns in Nome and the Native communities in northern Alaska. Witness the finishing of the race live in Nome when the first Iditarod Sled Dog Team arrives after an exhilarating trip of 1100 Miles throughout the most rugged, remote and challenging regions of Alaska. The ideal itinerary for the adventurous traveler. This 7-day program provides always the best and up-to-date race action - guaranteed. Just fly to Nome and leave the rest of the logistic to us. We continuously monitor and gather information about the ongoing race to find out were the top mushers currently are. According to the information you'll fly you out to a particular checkpoint with a lot of race action and do not waste your valuable vacation time on a checkpoint with no race activities at all. During the winter of 1925 a diphtheria epidemic raged among Inuit in the Nome area. Fierce territory wide blizzard conditions prevented delivery of a life-saving serum by airplane from Anchorage. A relay of dog teams was organized to deliver the serum.